Over the last few days, there have been a number of articles on the internet suggesting that the Trump Administration may be getting close to imposing tarriffs on imported steel. Back in February, none other then Goldman Sachs noted that should the Trump Administration end up establishing tarriffs, it could result in slower growth and rising inflation and a trade war. At the time, an article for CNBC summed up the Goldman view. “President Donald Trump's drive toward tighter trade and immigration policies are set to dampen global economic growth, Goldman Sachs said in a note on Monday. Since then, it has become increasingly clear that Tax Reform is very likely to be delayed until 2018, and that in the meantime, we may see the beginning salvo in a trade war between the U.S. and China over steel. What’s more, Trump sounds disappointed that China has not been more effective in getting thru to North Korea and the latest conversations between China and the U.S. have been considerably more strained. debates of his presidency unfolded during a tense meeting Monday (June 26th) in the Roosevelt Room of the White House" where with "more than 20 top officials present, including Trump and Vice President Pence, the president and a small band of America First advisers made it clear they're hell-bent on imposing tariffs — potentially in the 20% range — on steel, and likely other imports." In other words, Trump - true to his campaign promises - is set to launch a global trade war after all, one where the main country impacted would be China, however the collateral damage would extend to Canada, Mexico, Japan, Germany and the UK and what may be even more striking is that Trump overruled his cabinet, as "the sentiment in the room was 22 against and 3 in favor — but since one of the three is named Donald Trump, it was case closed." Axios adds that while "no decision has been made, the President is leaning towards imposing tariffs, despite opposition from nearly all his Cabinet." Overall, many of the positive ideals that Wall Street rallied on when Trump was first elected - Deregulation, Tax Reform, Capital Repatriation, and Health Care Reform seem to be bogged down by Republican in fighting. The original concept that the legislative spigot would be open wide, and the U.S. had seen “the end of gridlock” is now very much in question. We simply have gridlock in another form. In our view, several potential negative outcomes could be shaping up. Apart from growing political risks around the Administration itself, and a dicey situation with North Korea, the potentially biggest game changer is the escalating Trade/Protectionist risk. In his campaign speaches, Trump frequently used a protectionist note as a rallying cry to make “America Great Again”. While this type of rhetoric understandably played well to the decimated crowd in many rust belt red states, it has been proven to be unsound economics in the past and would likely produce more harm then good. Nevertheless, it is likely that Trump will test the waters by imposing some limited Tarriffs to gain a bargaining chip (“Art of the Deal”) and at the same time, live up to some of his campaign rhetoric. Years ago, trade expert Robert Lighthizer wrote a piece on the venerable history of protectionism pointing out that post civil war, many republicans were overtly protectionist. “For almost 100 years after the Civil War, the Republican Party (led by men like Lincoln and McKinley) was overtly protectionist. Theodore Roosevelt, a hero of John McCain's, wrote that "pernicious indulgence in the doctrine of free trade seems inevitably to produce fatty degeneration of the moral fiber." While Trump’s initial intention may be more of a show piece than a true Teddy Roosevelt style ‘big stick’, he may nevertheless begin a trade conflagration that once sparked may be hard to control. With global growth basically very weak right now, and year over tear total credit contracting, all countries and trading blocks will likely lash out quickly at the first sign of protectionism. The EU, for example, in one of the links cited above, is already shaking a retaliatory trade sabre at the U.S. on Burbon exports, if the U.S. imposes a tarriff on Chinese steel. While the tarriff may also include German made steel, there is very likely blow back from Germany to the U.S., where German exports, namely the many BMW’s, VW’s and Mercedes cars exported to the U.S., will see their prices go up should high strength steel prices be forced higher. Higher prices in turn mean that producers will sell fewer units, and so producers quickly plan to raise prices and lower output. This shift down the output/supply curve, (“produce less, but raise prices on what you do produce”) is the classic hallmark of a pre-recession inflationary spike. Ultimately, the real outcome is first slow-down, then recession, and if unchecked will ultimately lead to deflation. In the early innings, (especially post a sudden price shock such as the imposition of tarriffs), the first visible sign of an onsetting recession is a bout of late cycle inflation with rising prices and lower production. Barclays’ chief economist estimates that the economic drag that tarffs on imports from just China and Mexico, assuming 15% on Chinese imports, and 7% on Mexican imports would see a 0.5% decline in US. GDP growth next year. A key element to focus on with tariffs is that this sudden price shock is not offset by a corresponding wage increase, so for the average consumer, there is no offset and a decrease in ourchasing power, and thus, spending slows. In his 2016 election campaign, Trump accused China of committing, “the greatest jobs theft in the history of the world”. While there are many who wonder how Donald J. Trump was ever elected to the office of the President of the United States, one thing of which we can be fairly certain is that during the campaign, candidate Trump pounded away at strong protectionist themes in key states like Michigan, Pennsylvania and Ohio, states that ultimately put him over the top in the electoral college. This global labor arbitrage by Corporate America saw a relentless thirty-year decline unfold in US manufacturing jobs, and at the same time, a huge increase in the US trade deficit, as items made overseas were then re-imported back to the United States from China and other countries. The directional correlation between the decline in US manufacturing jobs, which at one point was the bulwark for the US middle class, and the rise of manufacturing in China is unmistakable. Another way to envision and comprehend this thirty-year transformation is to plot the secular decline of U.S. manufacturing jobs against the rise in Chinese power usage. As the global manufacturing center was relocated from the U.S. to China, Chinese power consumption soared as industrials blossomed in China while manufacturing job counts collapsed in the USA. To this end, whether Donald Trump or his advisors understand the real nature of this problem, is a question very much open to debate. However, that Donald Trump tapped into an exposed and raw economic nerve spanning America’s heartland appears to be a significant explanation as to how and why he was elected. Many middle-class families in the U.S. in key red states have seen no income growth for thirty years, and have had to take on two or three jobs to make ends meet. For them, any message (no matter who the messenger) that offers hope for a change leading to more jobs would likely resonate. Since the early days of the Trump Adminsitration there has been something of a civil war taking place between the Pro-Globalist economic flank and the “Make America Great Again” economic nationalist flank. On the Globalist side, Gary Cohn and Stephen Mnuchin, both Goldman Sachs alums. On the economic nationalist front, there is Peter Navarvo, the head of Trumps new National Trade Council who in the past has been a sharp critic of China, and penned a book a few years ago entitled “Death by China”. It is possible that if the Trump Administration decides to go ahead with trade tarrifs, Cohn could queitly exit the Administration. That would give the upper hand to the Economic Nationalists, something Wall Street does not like and would frown upon. One reason that trade is such a key element is that thirty years of corporate manufacturing outsourcing has left the US. with a domestic manufacturing base that is now a shadow of its former self, with much reduced domestic manufacturing capacity. While some products are indeed assembled in final form in the United States and thus qualify (loosely) for the term “Made in the USA”, in truth, most product components are made somewhere else and imported to the United States. This has everything to do with the higher level of labor market regulation here in the states, and the resulting comparatively higher labor costs. As a result, if tariffs are imposed by Trump there will be higher import prices, and because the U.S. has effectively outsourced its manufacturing base, in many cases, there is no longer a competing domestically made substitute to hold down prices. Back in the 1970’s when foreign prices surged, take for example a Toyota car, there were domesrtically made cars such as Ford or GM that could hold the line on price and would actually gain market share if prices for the foreign import rose. In that way, the presence of a domestically domiciled manufacuring base tended to hold down prices for consumers by giving them a cheaper alternative, and one that could thrive and create employment in an environment where import prices were moving up. Today, that really is no longer the case, as the US has shed manufacturig jobs, it has become a service economy that effectively is now a price taker when it comes to basic manufacturered goods’ prices. This means that once import prices surge, there will be a wave of import price inflation that would be hard to check and the Dollar will tend to weaken. In today’s situation where the US is importing a great deal, tariff induced price hikes could translate into higher overall inflation as there are not enough domestic substitutes available to restrain import price shocks. Further, if China were to devalue the Yuan, it would put downside pressure on wages globally as one of the world’s low cost manufacturing bases retaliates by trying to become even cheaper. This would in turn put domestic labor at an even greater competitive disadvantage and would tend to put downside pressure on wages worldwide. During the anemic economic recovery of the last 9 years, what I call the defibrillator recovery because central banks have had to prop it up the entire time with constant jolts of monetary stimulus, there has been virtually no upside pressure on wages the entire time. Even now, with the so-called Unemployment Rate at 4% and near what the Fed considers to be full employment, we see the Phillips Curve logic collapsing by the week, as there is no late cycle wage pressure building in any of the labor market wage gauges. Average Hourly Earnings, the Employment Cost Index, and Real Hourly Wages are all showing an absence of upward pressure on wages, which is not supposed to be happening when there is full employment. Of course, the real reason that wages have been slack is that in the current situation we do not have full employment or anything close to full employment. Instead of full employment, we have a huge supply of excess labor that has dropped out of the labor force and is no longer included in the labor force and hence represents a substantial source of unaccounted for labor market slack. If the Trump Administration launches a round of protectionist tariff increases, the odds are high it will act as a slowing mechanism that could tilt the global economy into a period of contraction. Central Banks world-wide have nearly exhausted monetary policy over the last few years with vast Q/E money printing programs and ultra-low global rates. Right now, there are few arrows left in the monetary policy quiver to deal with a new recession and slow down. Policy in the states would have to revert very quickly from monetary tightening and hiking rates, (as the Fed “dot-plot” currently projects) to rapid easing as policy makers look to quickly counter a slow-down and the likely substantial negative wealth effects that would come with a sizeable stock market decline. This reversal in monetary policy would be bullish for long-term US bonds, where yields would likely fall (sell stocks/buy bonds). It would also be bearish for the US Dollar which has been slipping into a down trend even as the talk in the last few months was for hikes in short-term rates. Above: the US Dollar Index is in a down trend, a break below 93.40 would be very bearish. For gold, a potential trade war would be very bullish because it would create a large new dose of economic uncertainty. While there are those who rigidily cling to the idea that gold is an inflation hedge, this is incorrect analysis as gold is an economic uncertainty hedge. As an example, when the Federal Reserve stepped in with Quantitative Easing Two (QE2) in November 2010, the initial market reaction saw gold advancing in tandem with stocks as many feared the unknowns of unbridled central bank intervention and money printing. 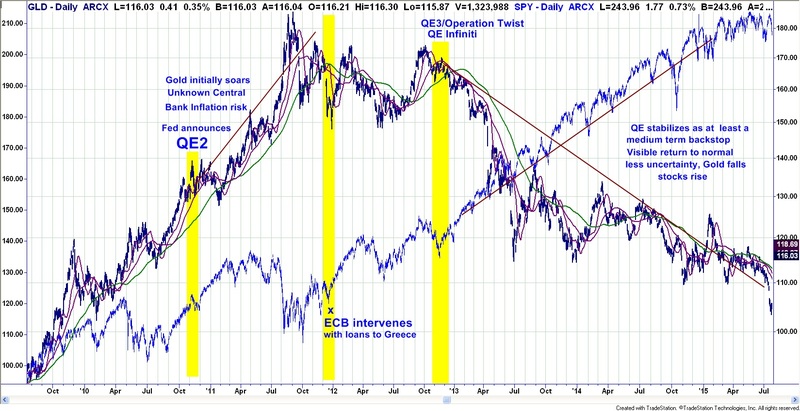 Then following the Greek collapse, and subsequent ECB bailout of Greece (which was needed to save European Banks, the ECB extended credit to Greece on December 8, 2011) the U.S. Fed followed the ECB (a few months later) with QE3 and Operation Twist (September 2012). From that point on, with the world awash in liquidity, “certainty” returned to the capital market view and the threat of economic uncertainty receded. gold fell and stocks advanced. We show these three key events highlighted with yellow bars on the chart below which shows the decline in gold and the rise in Stocks as central banks stepped in to shore things up. While economic certainty seems to reign supreme at the current time, underlying the current economic foundation are a number of unresolved and unfixed economic fault lines. A protectionist shock would create a great deal of new found uncertainty, and would also tend to hurt the Dollar. Both of these would be major drivers for the price of gold. In my view, money would quickly perceive a world of rising finished good prices (headline inflation), downward pressure on global labor, and view this as a full on return to stagflation. Ultimately, should there be a financial crisis (China? Chinese Banks?) that results from a downturn, a decent argument could be made that over time the ensuing shock could become very deflationary and thus raise economic uncertainty to multi-year highs. It would be the opposite of today’s ebullient low VIX environment, and gold prices could soar in that climate, as Central Banks would have far less manuevring room. Gold stocks would explode since the price of their final good, namely gold, would be going up in value, (boosting cash flow and total revenues) while energy prices (a major balance sheet expense) would likely collapse as a renewed slow down would only aggravate what is already a big supply glut. Lower energy prices would help mining companies on the cost side, and translate into a lower diesel fuel expense for running haulage trucks and other heavy equipment. Further, gold stocks would be attractive because the price of gold would actually be rising likely in inflation adjusted dollars, which means that the constant dollar cash flows coming from mining companies would have an incresing purchasing power just as they did in the 1930’s. 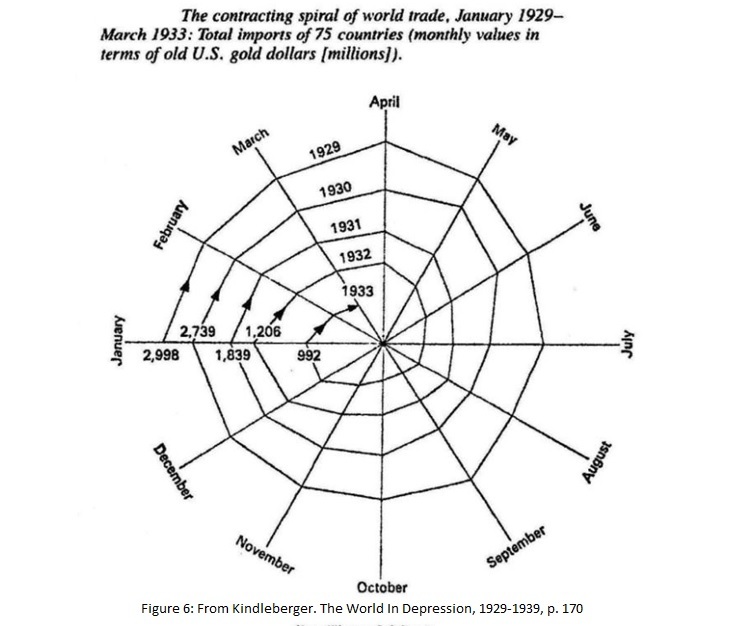 Back in the 1930’s the world was on a fixed gold standard, and when the Great Depression started, as the general price level collapsed, and gold was fixed, the purchasing power of gold soared relative to everything else. Gold mining stocks saw their cash flow streams benefiting from vastly increased purchasing power and were able to pay out huge dividends in addition to seeing their securities’ prices soar. That trend had its real kick-start in April of 1930, when the U.S. passed the Smoot Hawley Tarriff Act which initiated a global trade war and saw global trade begin a long downward spiral that acted as an engine for the Great Depression. Ironically, a new tariff inspired trade war today, could have very similar effects despite the fact that gold is now free floating, instead of on a fixed rate gold standard. While obstensibly the outward circumstances look very different, in reality, the underlying economic structures and circumstances are actually quite similar. Above: Chart originally produced by Casey Research shows gold mining stocks (more specifically, Homestake Mining, a great proxy for the group) soared even as the broader equity market collapsed in the 1930’s depression. The trigger was the passage of the Smoot-Hawley Tariff Act in June 1930, which has been anticipated many months earlier and triggered strong retaliation from overseas trading partners and was passed despite objections from many economists at the time. As the price of gold stocks soared, and they paid out huge dividends to boot. Above: Decent into The Great Depression was led by a down ward implosion in the volume of world trade, depicted in the chart above. The genesis of the situation was the age old discussion of free trade versus fair trade, and keeping the playing field level. Tariff wars produced a global withdrawal which had disasterous affects. Source: Charles Kindleberger, The World in Depression, 1929-1939. Today, while the outward circumstances may look totally different, the net outcome could end up being very similar, and once again, the conversation of the day is rapidly returning to the age old discourse of Free Trade versus Fair trade. Over the last few years, the gold mining industry has gone through a forced depression, squeezed by soaring costs and compressed margins. For many companies, comparatively low gold prices (relative to rising costs) sidelined as uneconomic many gold reserves and forced gold mining CEOs to rethink and refocus their strategy. In the past, mining companies appear to have squandered much of the spoils of a prior gold bull market on bad acquisitions, and unchecked costs. Today, most mining company CEOs are now back to basics and focused on cutting costs, doing strategic partnerships, and growing cash flow with an eye to paying out dividends to yield starved investors. This is a stark contrast for an industry that about a decade ago was focused on growing reserve base data and ended up booking artificially inflated, uneconomic in the ground reserves. Consequently, we see the current trends as a healthy development within the mining sector creating companies that are cheap on a price-to-cash flow basis. Over the last two years, majors such as Barrick Gold, and Newmont Mining have returned to solid levels of free cash flow and could be well situated to start boosting dividends in 2018 and beyond. Others like Goldcorp, Kinross, and Yamana are also making strides in the right direction. Overall, with fundamentals improving within mining, the key equity sector that could benefit from a new outbreak of protectionism would be precious metals mining stocks. When sectors advance for a protracted period of time, and especially when they advance at a time when the entire market is not doing well, there is always a major underlying theme at work fundamentally that is supporting the advance. In Washington DC, the White House has deemed this week to “Made in America Week”. In a few hours, President Trump is planning on signing a new proclimation designed to boost American manufacturing, and echo the Nationalist themes that premeated his campaign. Will the next step be a move toward tariffs? That is a key question, which could be answered in the days just ahead. Today, investors should pay close attention to this potential turning point as a 1930’s protectionist redeux, which may start out looking bengign and could then, once again, end up being one for the history books,. The last two decades have seen the world live through an unprecedented hyperinflation of global credit. At this juncture, with historic asset valuations and leverage in play, should asset bubbles burst the long-term deflationary consequences could be profound. 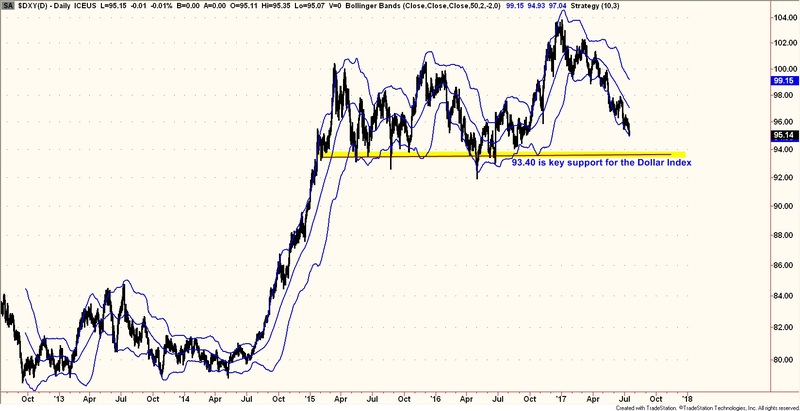 In this vein, rekindled protectionism may lead money to quickly seek out a new home, and gold Stocks and gold could be poised to borrow a page from their past, a page containing outsized returns in the years ahead. Sign up for future complimentary Salem Capital Markets Outlook Newsletters here. Disclosures: Salem Partners Wealth Management and the Salem Capital Markets Outlook is sent to our clients and friends to share some of our views on current markets. Materials in this report are copyrighted and proprietary to Salem Partners Wealth Management (SPWM) and may not be reproduced or distributed without our expressed written approval. All rights are reserved. Past performance is no guarantee of future results. All opinions expressed constitute Salem Partners Wealth Management’s judgment as of the date of this report and are subject to change without notice. This information should not be used as the primary basis for investment decisions. It should not be assumed that any security transactions, strategies, holdings or sectors discussed were or will be profitable, or that future recommendations will be profitable or will equal the investment performance discussed herein. Investing in equities and other securities involves risk to your principal. Individual client account performance will vary and no guarantee of any kind is made as to the results that may be obtained from using these reports. These reports are impersonal and do not provide, nor are they intended to provide, individualized advice or recommendations for any specific audience or portfolio. To the maximum extent permitted by law, Salem Partners LLC, Salem Partners Wealth Management and the authors of these reports disclaim any and all liability in the event that any information, commentary, analysis, opinions or advice contained in these reports proves to be inaccurate, incomplete or unreliable, or result in losses on any investment. The information provided in these reports is obtained from sources which the author believes to be reliable. However, the author has not independently verified or otherwise investigated all such information. Neither the author, nor SPWM guarantees the accuracy of any such information.